Another one of my baking projects this weekend for the bake sale to raise money for the homeless. While I enjoy baking, it feels even better knowing that my work is a labor of love. This is from my Mom's recipe collection and they were always on her list of holiday baking. 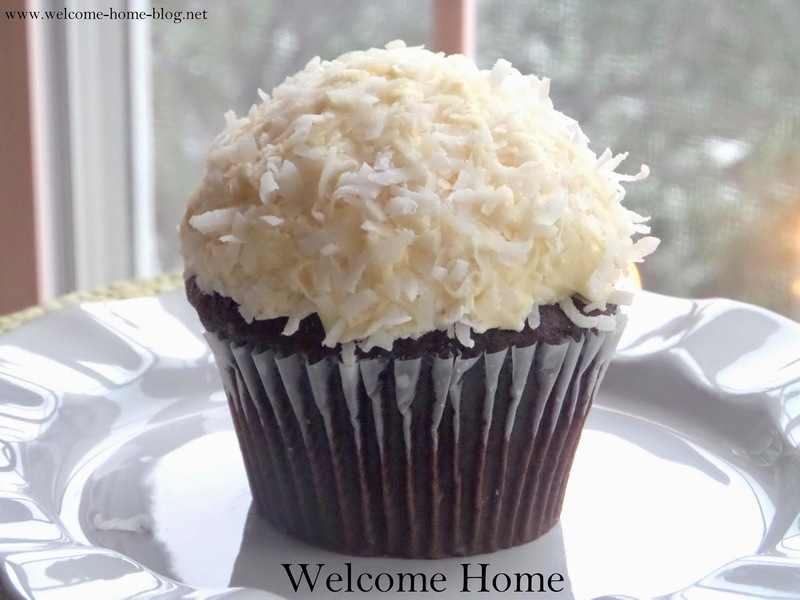 A pretty impressive cupcake for those who love chocolate and coconut. And this cream cheese frosting is the best! Transfer to the bowl of a mixer and beat on medium-low speed, 4-5 minutes, until the mixture is cooled. Mix in the eggs, one at a time, scraping down the sides of the bowl as needed and beating well after each addition. Mix in the vanilla and then the cocoa mixture and beat until incorporated. With the mixer on low speed add in the dry ingredients in two batches, alternating with the sour cream, beating just until combined. Divide the batter between the prepared cupcake liners, filling them about ¾ of the way full. Bake 18-20 minutes or until a toothpick inserted in the center comes out clean, rotating the pans halfway through baking. Allow the cupcakes to cool in the pan 10 minutes, then transfer to a wire rack to cool completely before frosting. With an electric mixer, beat butter and cream cheese on medium speed until smooth (make sure they are both at room temperature so you do not get lumps in your frosting). Add vanilla and coconut flavoring. Gradually beat in powdered sugar until incorporated. Beat on medium speed for about 3 minutes, until smooth and creamy. Frost cooled cupcakes and roll in sweet shredded coconut. These silicone cupcake liners just made me about 100 times more likely to bake cupcakes and muffins in the future! My kids love cupcakes but I am always hesitant to make them because I don't want to deal with the ones that either tear in half getting them out of the pan, or (if I use paper liners) tear in half getting the paper liner off!! !